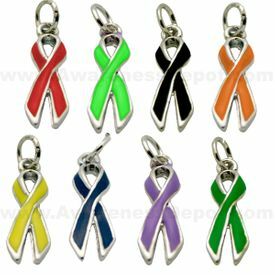 (Select the option drop down menu to pick your color) These gorgeous ribbon charms are 5/8" long and are silver-tone with an enameled color finish. They have an enclosure hoop at the top that allows them to be easily attached to your favorite bracelet or necklace. Available in all of our cancer awareness colors. A perfect gift for you or that someone special in your life. A great product at a great price! Comes affixed to an inspirational card for easy displaying or gift giving.